God bless you all during these summer months. 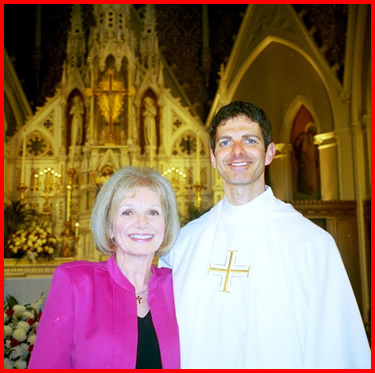 I am still on vacation this week and want to share reflections from another newly ordained priest. 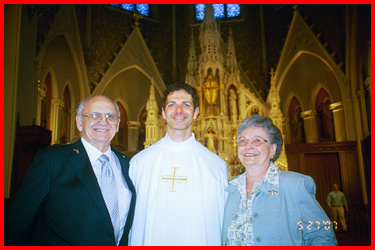 Father Robert J. Blaney was ordained on May 26 and is now serving in his first assignment at St. Mary Parish in Franklin. 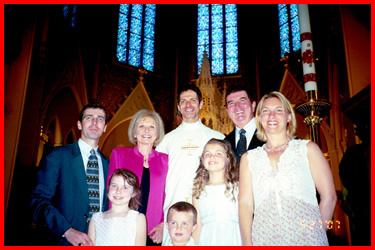 Thank you Father Blaney for your willingness to give readers a glimpse of God’s actions that led you to the priesthood. It has been more than a month after my ordination, and I still cannot get over the fact that I am really a priest! The events working up to the day of the ordination and the Mass of Thanksgiving happened so rapidly. From that day on, time has seemed like a blur. I have been so busy and so much has happened. 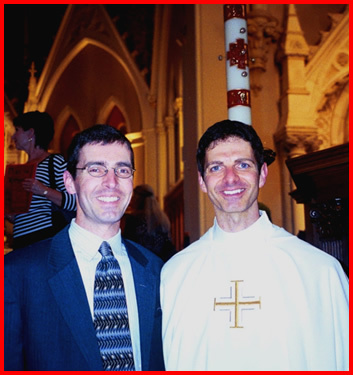 I moved into my first assignment at St. Mary Parish in Franklin and began a whole new chapter of my life as a Catholic priest for the Archdiocese of Boston. In these first weeks, one thing has been exceedingly clear to me — that these have been big-time, grace-filled days with the Lord carrying me along and pouring down many blessings upon me through all of the people with whom I have come into contact. Needless to say, I have felt a bit overwhelmed but in a good way, in an exciting way. My life journey up to this very day has had lots of turns and surprises. As I have aged, I have been working at getting better at knowing when to step aside, putting my self-interests away and responding to the workings of the Holy Spirit. What I have come to realize is that God, who has created us and knows all of us as the unique individuals that we are, communicates His love and His grace to each of us in a specific and personalized way. We should pray to be attentive to the extraordinary things that happen to us in our ordinary lives. There is a reason for everything. Confusion, fear or helplessness is best remedied by admitting to ourselves that we are only weak human beings and that we need God. It is only when we take the time that we are able to hear what God is asking of us. After listening to God, it is up to each one of us to respond so that we might be able to carry out God’s will. When I was 31 years old, I finally began to understand this. I was working as an actor at a regional theater, and on one weekend a pianist from the Zurich Opera House who was only slightly older than me gave a concert. Watching him playing the piano during the concert, I began to think about my own history as a concert pianist. I had been a bit of a child prodigy, competing in piano competitions in Boston, giving recitals throughout Massachusetts and performing at numerous events since I was seven years old. (For those old enough to remember the show, I competed on the Boston television variety show hosted by Dave Maynard called Community Auditions and was the “1973 Grand Champion of the Year.”) When I was 13, I made the decision to stop playing the piano because I wanted to “fit in” more and “be normal” like the kids that I went to school with. And so, sitting at that concert, listening to the pianist in 1996, I was struck by the fact that I’d let my very same God-given musical gift wither and die over the years. I recognized that once I had had the potential to be just as good as, if not better than, the guy on stage who was making his living as a successful pianist and conductor in Europe. I went back to New York City where I was living. Feeling guilty over the acute awareness that I had not made use of a gift that God had given me, I started playing the piano again, with great difficulty. I revisited pieces I had played as a child, but my hands were in such bad shape due to years of not playing. As the days went on, however, I got better and better. Much to my parents’ surprise, I asked them if I could move the grand piano they had purchased for me when I was 13 to my apartment in NYC. Ever-supportive, they were more than happy to oblige, and within the week the grand piano arrived at my apartment a little after midnight. For the next three months, all of my free time was consumed with playing the piano. All the while, my agent and friends were puzzled as to why I was spending so much time on classical piano — something so “unmarketable” that “would never help” my acting career. That was not a concern of mine, though. I just knew I had to do it for myself. Getting back to my musical roots and making the most of my talents from God was therapeutic for me, and within three months I was playing better than I ever had when I was performing regularly as a child. My expectations were even exceeded when, a month later, I mastered Bach’s English Suite II — the intricate opening piece in the aforementioned concert I’d recently attended. A year later, a new show opened in NYC . It was a two-person play called 2 Pianos, 4 Hands, and told the story of two men who had wanted to become professional concert pianists since childhood and who never saw that dream become a reality. Not having much money at the time, I volunteered to usher at the theatre in order to be able to see it. I was deeply moved by the show, and a week later I ushered there again. What touched me most was the universal theme of the play. Although told through the eyes of musicians, it could have been about athletes, scientists or accountants. The theme of how a person responds to the predicament of working towards a goal in life and then not reaching that desired goal was the plot of the show — one to which anyone could relate. What was most interesting to me was how the two characters evaluated their lives when, as adults, they looked back over the sum total of their life experiences to see who they had become. Each man determining for himself whether or not he was “a success” — regardless of society’s opinion — was a positive and empowering thing to watch. I had done the very same thing in my own life the previous year, and to see this message conveyed in the show was very affirming. Needless to say, the fact that the two characters in the play were pianists allowed me to be able to relate even more. Friends and colleagues, upon hearing of my enthusiasm for the show, encouraged me to get an audition for it, but I convinced them all that it was out of the question — there was a great deal of classical piano playing in the show. I thought that the level of musicianship required was way beyond me, especially since the play ended in a mini-concert with the two men, in tails and at concert grands, playing Bach’s Concerto in D Minor. Unbeknownst to me, my agent got me an audition for it. After pleading with him that I was not capable of auditioning, he persuaded me to pick up the audition material and give it a shot. Well, because of my own personal pursuit of getting back to playing the piano the previous year (and learning Bach’s English Suite II), I soon realized that I was capable of auditioning. I had even been working on the perfect, most appropriate audition piece for the prior year without even knowing it! I just could not believe it — the whole series of “coincidental” events that had transpired. Terrified, yet enthused, I auditioned and got cast to take over the role from one of the creators. Classical piano, something that I returned to for interior reasons, had brought me a starring role in a Broadway show. I was fully aware that God had given me the gift of this show, and that all of the seeming “coincidences” had rather been part of His mysterious plan. 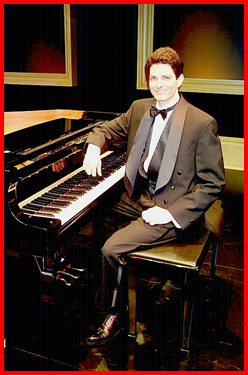 I performed 2 Pianos, 4 Hands in the New York production, the Canadian production and the U.S. National Tour from 1998 to 2001. For me, parts of it felt like a play within a play, and some of the dialogue could have been extracted from my own life. The demands of doing the show were many — continually practicing to maintain the concert piano level standards; balancing health and sanity amidst an eight-shows-a-week schedule and constant interviews, press events and publicity appearances; and dealing with the pressure that came along with headlining such an expensive and high-profile operation. My faith in Jesus Christ allowed me to get through many stressful times during this period. Every performance began with prayer, was interspersed with prayer, and ended with a prayer to God. Oftentimes it actually felt that Jesus was carrying me whenever I would get nervous or feel panicked. My prayer life increased tremendously during those three years, and I realized that I could not do any of what I was doing on my own. On a couple of occasions, I was aware that it was God who was playing (through me) Bach’s concerto on stage when I, myself, would be so paralyzed with stage fright. Somehow, He kept my fingers moving while I seemed to float above the stage, watching it all. Artistically, it was a unique and wonderful opportunity. The script combined gritty dramatic scenes along with physically comedic ones. Both actors played 14 different characters throughout the play, and the play’s denouement was a mini-concert which allowed me the opportunity to experience vicariously what it would have been like to be a professional concert pianist. Unexpectedly and ironically, I discovered that my newfound success did not totally fulfill me. I had been reaching for a level of status in show business since I moved to NYC in 1987, and once I had it, it was not all I thought it would be. I began to feel a sense of emptiness and apathy, but I could not pinpoint exactly why I was feeling that way. I was now being sent out on many good auditions and long-closed doors were opening for me, but I was not even interested in pursuing them. Being an actor now seemed meaningless to me, and this realization found me perplexed. During this time, I realized that I wanted to connect with something more real. Sensing that my priorities were shifting, I began praying for direction in my life. (My mother later revealed to me that during this same time she had been praying to God for me for the very same thing.) I began to read and pray the Bible, Thomas a Kempis’ My Imitation Of Christ, and The Catechism of the Catholic Church. Simultaneously, I found myself going to Mass more and more frequently, cultivating a relationship with Our Blessed Mother, meeting other Catholics of my generation and, most importantly, spending a great deal of time in front of the Blessed Sacrament. In what seemed at the time to come out of nowhere, I suddenly heard God asking me to give my life for His Church. When I first experienced this “call” to the priesthood, I was intimidated and frightened by the whole notion, did not tell anyone about it and tried to block it out of my mind. But every day there would be some event — a remark made by a friend, something I had read in the newspaper, a scene in a movie — that continually reminded me that God, indeed, seemed to be calling me for some work far greater than myself. I was stunned by this challenging offer, as the idea of the priesthood had never crossed my mind my entire life. Not to mention that I thought I was too old and unworthy of such a calling. I immersed myself in prayer, and brought up to God all the reasons why I did not believe I should answer His call. And one by one, every one of my issues got resolved in such a way that, as the days went on, I found myself becoming peaceful and even enthusiastically joyful with the decision to investigate what it entailed to discern a vocation to the priesthood. I still realized that I was unworthy, as we all are, but God gave me the necessary grace to follow Him. I applied to St. John’s Seminary in January 2001, gave my notice and left 2 Pianos, 4 Hands in May, and entered St. John’s in September. So now, six years later, I find myself beginning a whole new chapter of my life. I am living in Franklin, Mass. where my brother, his wife and children live. I am back near the town in which I was born and raised, Framingham, and where my parents still reside. And I am a Catholic priest. Do I feel blessed? Totally! Do I, even more so, feel humbled? Absolutely! 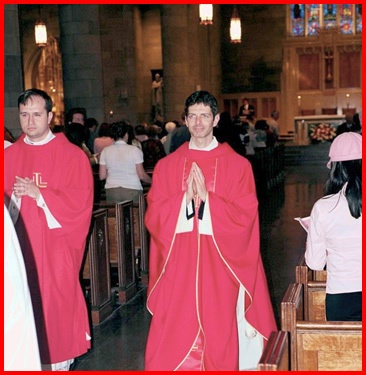 I am so thankful to the Lord for having called me to serve Him and His Church as a priest. 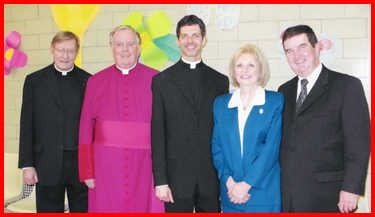 I am honored to serve the people of God in the Boston Archdiocese. I promise to pray for the grace that is needed for all of us to grow together toward a deeper knowledge of God’s Love. I ask you to continue to pray for me, for my six brothers who were also ordained in May and for all the priests who serve the Archdiocese of Boston. May God bless us all. Dear Cardinal O’Malley, I am visiting your blog for the first time and I am absolutely thrilled to see the work you are doing. As a Catholic who has been devastated by the sorrow of the U.S. Catholic church the last few years it is so heartening and exciting to be able to share the holy missions you undertake on a weekly basis. congrats fr. 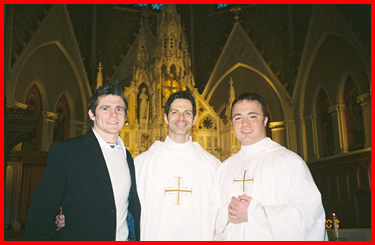 blaney upon your ordination to the priesthood. all of us here in framingham will be praying for you in your new endeavor. 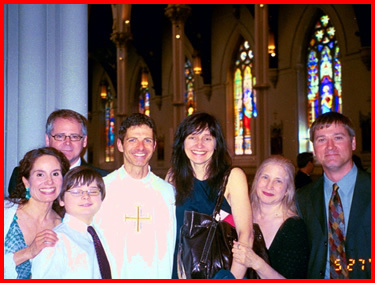 Congratulations, Father Blaney, on your ordination. This prayer is for you and all who have heared the call and have entered the vocation of the priesthood. Thank you to be a friend to inmates in prison. I also go to confess every week to the Juvenile Hall here in California. May the Holy Ghost bless you in your service to our Holy Catholic Church. How wonderful God is to use our gifts and talents to lead us where He needs us most. May He continue as you labor in the vineyard as one of His shepherds. 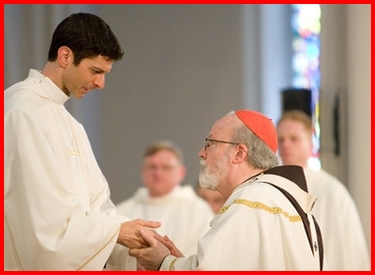 My prayers are with you as you begin your priestly journey! Father, congratulation, grace and peace of Christ Jesus be with you throughout your ministry! You will be a tremendous blessing to the Church, for sure. And you are very fortunate to work in a diocese that certainly needs Christ’s healing, and I am sure you will be used as an instrument towards that end. May Jesus and Mary reign over your heart! Peace! Just finished reading your story Father Blaney. I do believe your next calling will be as a writer. It appears you are in the third phase of your being. You are a very talented guy with tremendous insight. Your soul searching was for a reason. It is true we never know why we are placed in certain, peculiar situations during our lives then all of a sudden it hits us. That’s why I was in that place in time to prepare me for the next phase of my life. Life is full of the unexpected. You were born into this world for very special reason. To date it has been quite a journey for you. You have brought a lot of enjoyment to a lot of people through your showbiz career and sharing your trials and tribulations is embraced. Your life will continue to be busy busy busy conveying the message of the Lord. You are his instrument in concert. 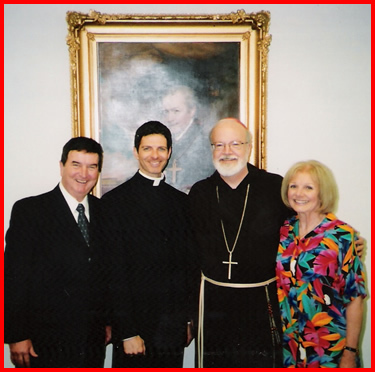 Father Andreas Davison was assigned to our parish for the final period of your seminary studies. As a result we were privileged to be at the Cathedral for your ordination to the deaconate and to the priesthood. Your life history coincides in several respects with ours. My wife and I were New York actors in the ’60s and 70s. God called us out of that life, too. Our daughter Elaine is a concert pianist (MM, N.E. Conservatory) and a teacher of 23 piano students. Thank you for answering God’s call. I pray for you and your classmates each day. God Bless you. What an amazing story! I too have found myself (probably around the same age) tossing and turning in the sea of life without a rudder. Finally the trials were so great, that in my despair I turned to our Blessed Mother and said to her, “I don’t really know you, but I am giving this problem to you…and turning my life over to your care…” I immediately felt the embrace of a mother that I had never felt in my life! An intense prayer life followed (an continues) and I found myself for the first time in my life seeking God’s will for me and then asking for the grace to follow His will. Many blessings have come my way since…but I can identify with you on feeling very humbled by the whole experience. Often found myself asking, Why would you choose me Lord? God bless you in your priesthood! I pray that you will lead your flock fearlessly, ultimately leading them to heaven. You have been gifted by the Lord and your enthusiasm on your ordination day underscores your appreciation of that gift from the Lord. May He continue to bless you in your ministry. Dear Father Bob, I am an accountant from New York that wants to thank you for sharing this very personal and inspirational storey of your life. What a great uplifting post. Wow! God is amazing! God Bless. Thanks so much for sharing. It was so moving and honestly very helpful. It’s so great to know that you experienced so much and still gave your life to the Lord. I pray that God continues to bless you and your ministry in the Church! Father Robert, that’s a great story about how God called you to the priesthood. Thank you for answering that call, and I pray that plenty of other men will follow your footsteps and into the priesthood. God bestow on you countless blessings! What a great story your life has been so far! 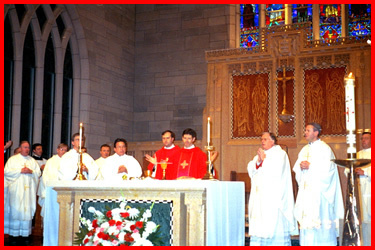 Many blessings on you and your fellow priests who were ordained on May 26th. Incidently that is the same date Padre Pio was baptized and the date Fr. 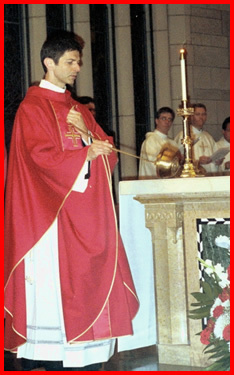 Corapi was ordained by Pope John Paul II with Mother Theresa present at St. Peter’s. I was also born on that date and I am considering a vocation to the priesthood. Please pray for me and I will hold you and all of your brothers in prayer. THE GUGLIEMO FAMILY MUST BE JUMPING WITH JOY UP IN HEAVEN. KUDOS TO YOU FATHER BLANEY. YOUR FAMILY MUST BE VERY PROUD OF YOU. GOD WON OUT. A wonderful story and a moving example of how those who are “of the world” in their occupations are called to their best and most blessed. Shows you have perfect pitch because you have very good hearing! I’m very glad for the fullness of your journey. Many blessings. I tried to leave a comment earlier. but apparently it did not get through. I want you to know that a blogger I know only as “Jeff” has changed my life. I am not a Catholic, but his kindness and consideration will ALWAYS be appreciated by me, and indirectly by my wife, daughter and grandkids. I will never forget his kindness. 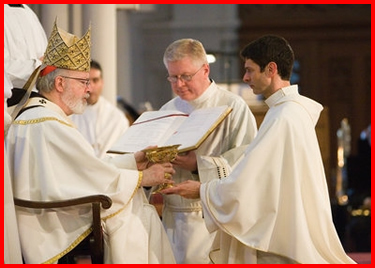 Congratulations, Father Blaney, on your ordination. What wonderful gifts you bring to the service of your parishioners! I am grateful to belong to a parish whose talented pastor shares his many gifts with us. Our liturgies are reverential, music beautiful and homilies thoughtful and well prepared. Not all parishes are as fortunate as we are. May God bless you in your work. Praised be Jesus Christ! Now and Forever!! Thank you for answering the call. The Church is blessed to have fine men like yourself. Thank you for taking the time to share your experiences with us. Ad multos annos! What a great and faith-filled story! Thanks so much for sharing it with us. And please pray for me as I try again and again to open myself fully to Christ. I will include you in my prayers. Thank you for your inspiring story. Sometimes its so hard to believe that God talk and remind us of his call through our friends, the people we meet, or the blogs we read. I may have the same fear that you expereinced when you relaize that God is calling you and feeling that emptiness even to the fact that you have already made it to the top. Thank you again for sharing your story and your life. God bless you always and your ministry. Congratulations and God bless you, Rev. Blaney. 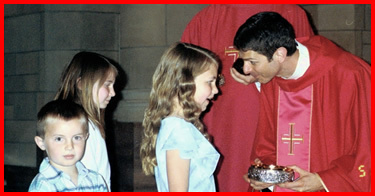 After reading your story, the Catholic church is very lucky to have you as one of it’s priests. God-bless you. Congratulations, Father! Ad multos annos! Great story of your life before the Holy priesthood. Perhaps someday you can play with/for the Holy Father. Do you play Mozart? I hear he’s a big fan! I am always thrilled to read of new ordinations. I’m a long way from the Boston diocese (Wichita, KS), but we are all one Church. We had four ordinations to the priesthood this year in our diocese, and three ordinations to the transitional diaconate. God has blessed us all richly. Once again, my heartfelt congratulations! May God bless you and keep you, Father. May He richly bless your ministry to His flock.